Just like the gals of WWII’s U.S.O., this dress doesn’t quit! Made of sturdy 100% cotton fabric, with style lines that make looking beautiful as easy as pie! The true-to-40’s style lines are accented with contrast piping, shoulder yokes are gathered, tops of sleeves are gathered and finished with neat cuffs, and the waist is cut to enhance your curves. Bodice closes with two fabric covered buttons and a sturdy side zipper. This dress wouldn’t be complete without this lovely vintage reproduction fabric. 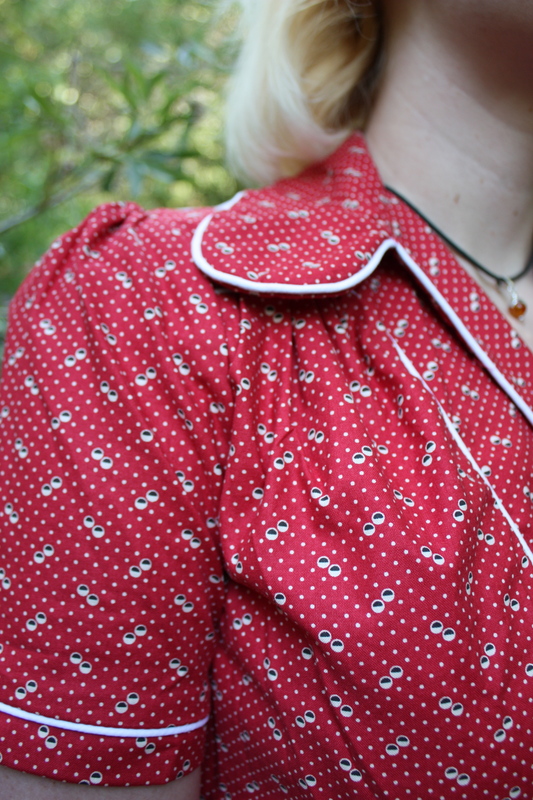 The 100% medium weight cotton fabric is a lovely brick-red with off-white polkadots and bubbles in an art-deco style that makes this dress very true to WWII era dresses. 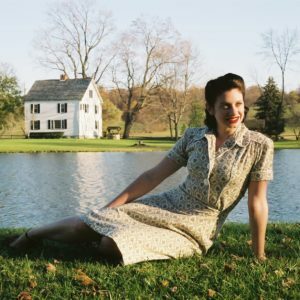 Many 1940’s day wear dresses would have been similar to our U.S.O. Girl Dress, especially with fabric that is slightly outdated for the time. Many daywear dresses in the 1940s were made from unused, reused, or repurposed fabrics that were lying around. 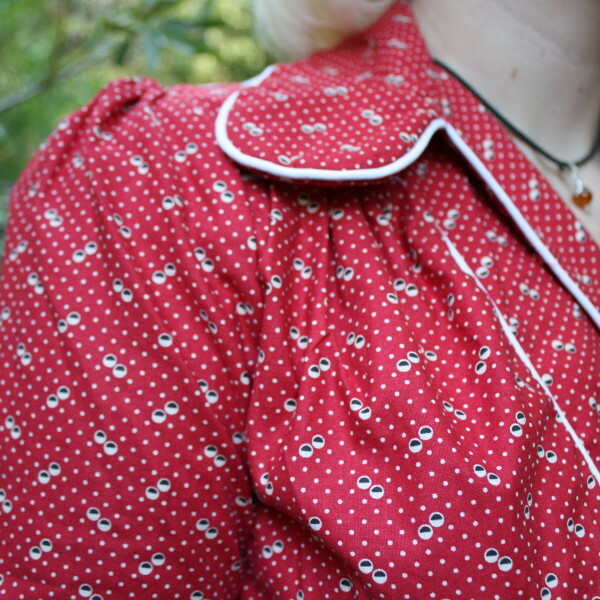 This detail makes this dress very historically correct, and happens to be gorgeous fabric, too! Available in sizes 4-16 and Plus sizes 18-24 (prices vary). Please check our size chart carefully to determine your size and feel free to contact us with any questions on sizing. Don’t fit into a standard size? Consider having this dress Made-To-Measure. Want this dress even more unique? Consider our haute-couture services. Dry Clean or Hand wash in cold water, lay flat to dry on drying racks or hang dry.